I woke up at 2 a.m. this morning and flipped through my MANY cable channels. I stopped at the movie Broadcast News. I had seen it many times before, but I saw it with new eyes this time. 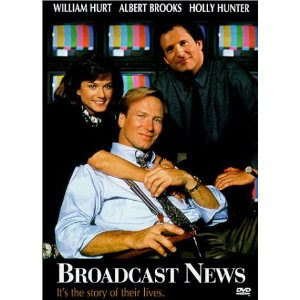 The 1987 movie centers around three folks who work at a television station. There's Aaron, the super smart, super talented average-looking guy who is a great reporter. There's Jane, the driven, career-minded producer whose energy leaps off the screen. And then there's Tom, the handsome anchor who is all style and no substance. The film is a love triangle. Aaron loves Jane. Jane loves Tom. Now even though Aaron adores Jane from the top of her perfect nose to her tiny tiptoes, Jane lusts after Tom. She knows he's not smart and realizes he is not honest, but she is enamored with his movie star good looks. During the film, Jane asks Aaron, where he thinks they'll all be in 10 years. He said, "I'll be married with kids and you'll be single and fat." Indeed, 7 years later, they all meet up at a function. Tom is engaged to a beautiful blond and Aaron is married with a cute kid. Jane? She is still single. Her career is her life. I have met so many Aarons - average-looking, yet good guys who are brilliant, sweet, kind, caring. But I always ignore them in favor of the Toms - dumb dudes who are all style and no substance. You would think after more than 20 years of dating, I would get it right. But for some reason I always go for the losers and then I end up disappointed and frustrated. It's a pattern and right now I don't understand why I just can't love the good guy. In the meantime, the Aarons I've met have gotten married and the Toms have moved on to their next conquest. Me? I'm Jane, alone with my career. Why do you think I always choose the losers over the good guys? Maybe I have a self-esteem issue. I want love. I believe I deserve love. But I always sabotage myself by hooking up with guys I know deep down are no damn good. Cause Aaron is "boring" with his dependability and sincerity while Tom seems exciting. Frankly I have always BEEN an Aaronita -- the dependable, genuine chick in your corner that keeps getting tossed over for the "exciting" but fickle Tomasinas. Kinda sick of that ish right now. Why do people run toward drama?